While millennials aboard electric scooters with names like Bird, Lime and Spin speed headlong into Silicon Valley’s next great ride-sharing war, we rather prefer an older breed of low-power commuter vehicle: the humble moped. 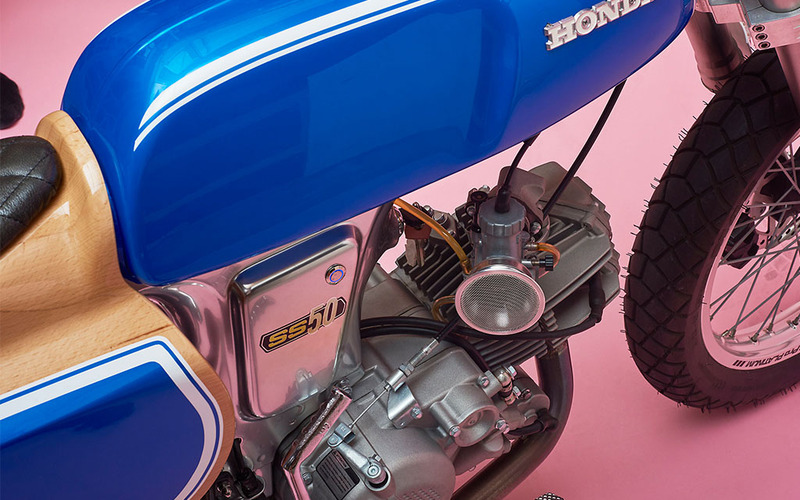 Plenty of vintage numbers have been getting the restoration treatment of late to stunning results, perhaps none better than this 1972 Honda SS50 “Wild Horse,” a Willy Wonka-meets-Steve McQueen custom build imagined and assembled by George Woodman. 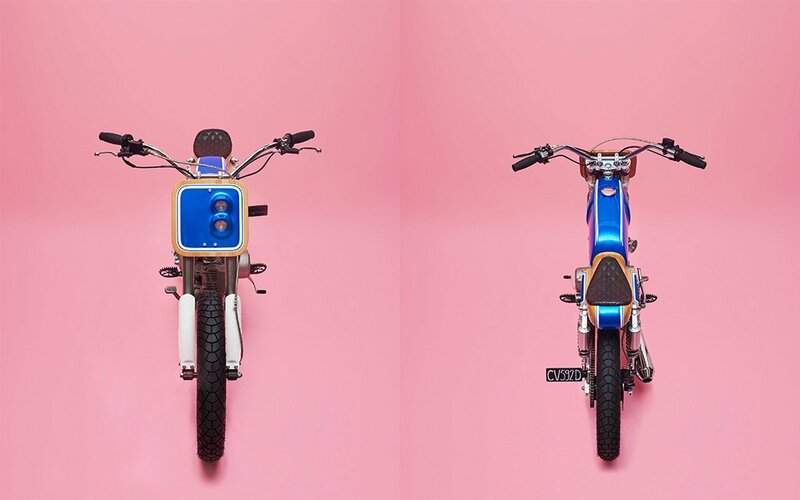 Woodman is actually Sebastian Valliergues, a Biarritz, France-based woodworker who builds a few bikes each year, often infusing his creations with a healthy dosage of, well, wood. 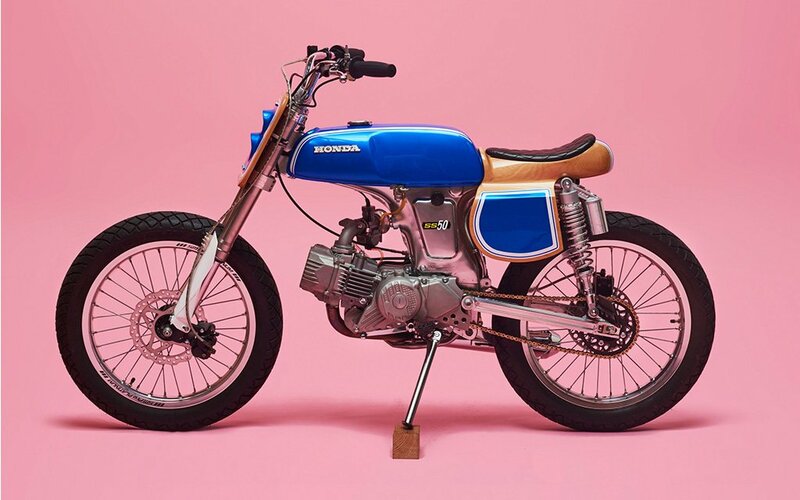 For the Wild Horse, he added a polished seat base that was most definitely not in the original ’70s version of the moped, along with a front plate for holding the halogen headlights. Both are made of beech wood. Valliergues didn’t stop there, though. He’s already got a bike called the “Smoking Black Fish” enshrined in a museum in Dallas, so his engine expertise is a tad more serious than you’d expect for a carpenter’s side hustle. Valliergues switched out the 49cc engine for a 199cc Zongshen and pumped the output up to a worldbeating … 22 HP. Keep in mind, the SS50’s a light bike. So with that sort of increase in power, the nickname starts making some sense. To compensate, he leveraged new shocks, front brakes, a start system and larger wheels supporting some get-out-of-my-way Michelin tires. But we’re hung up on that gleaming cobalt blue paint job, to be honest. For more more information on the project head here, and check out Valliergues’s other projects here.